[lunch]And that is it for the morning session on day three at Headingley. England's tail was rolled out in the morning before Sri Lanka's opening pair survived until the interval, although they did so without reducing the first-innings deficit significantly. The lunch break is almost over and play will restart in just three minutes or so. England will be looking for quick wickets at the start of the afternoon session. @SkyCricket will someone please tell me what has happened to England's fielding over the last couple of years?! @SkyCricket Sri Lanka morning, but how many catches do we want to drop. Anderson takes the first over after lunch and concedes a boundary when Karunaratne cuts him over gully and away for four. The paceman tightens up his line and almost gets the left-hander to chop onto his stumps after rearing one in towards his body. Jordan continues and Karunaratne flicks his second ball down the leg side for a single before Silva does the same, although this time the ball races away to the long leg boundary for four runs. Five from the over. Anderson and Prior go up for a caught behind appeal but replays shown the ball brushed Karunaratne's leg rather than the bat or glove. There are no dramas for the remainder of the over, which ends up as a maiden. Jordan opens up at the other end after tea and sees his first ball cut away through backward point for a single by Sangakkara. He then concedes a leg bye as two runs come from the over. Jayawardene runs a single off Plunkett before Sangakkara plays and misses when fishing at a short one outside off stump. A drive from the left-hander then gets past Moeen at short cover and trickles away to the boundary for four. Sangakkara defends the final two deliveries of the over. The tourists are now two runs ahead with two wickets down. Jordan does well to keep Jayawardene blocking on the back foot and completes his third maiden over of the innings. The two batsmen trade singles to start the over and Sangakkara adds another later in the over when he plays Plunkett away to deep point before Jayawardene ends the over with a fourth single. Jayawardene gets a top edge off Jordan but it goes high above the heads of the slip cordon and bounces away to the boundary for four. Just two other singles come off the over as the batsmen keep the strike rotating well. Broad is brought back into the attack but Sri Lanka's star pair deal with the new threat well and keep the scoreboard ticking over with two more singles. Jordan continues his spell and gets one to bounce up nastily into Jayawardene, who manages to get his bat in the way just in time. The batsman continues to defend for the rest of the over and Jordan bags another maiden. Some uneven bounce as Broad gets one to skid low through to the wicket-keeper and then gets one to rear up unexpectedly into Jayawardene, who feathers a soft edge onto the floor to second slip. Two singles come from the over as well as a bye as Prior was unable to take the low-bouncing delivery cleanly. England concede more extras as Sangakkara pads one past Prior and away to the boundary for four. A no-ball follows later in Jordan's over while Sangakkara and Jayawardene take two more singles from a relatively expensive over. Big appeal from Broad as he raps one into the pads of Jayawardene, but only via a massive inside edge. The rest of the over passes off without drama as Broad completes a maiden. England bring Anderson back into the attack but he cannot break the duo up as Sangakkara works him through backward point for two and then drives him down the ground to the boundary for four. [benedictbermange] Kumar Sangakkara is four runs away from equalling the world record for seven successive Test match half-centuries. Jayawardene steers Broad past the slips for a couple then trades singles with Sangakkara to get back on strike. Broad then bangs one in short but also wide and the right-hander flicks it away square of the wicket for four more runs. Hello everyone and welcome to interactive coverage of day four at Headingley, with the Test match and series in the balance. Sri Lanka will resume their second innings shortly on 214-4 – 106 ahead of England, who will be hunting morning wickets with the new ball available in seven overs time. Over-by-over updates and expert views from the commentary team coming throughout the day. That was an excellent delivery from Anderson, Jayawardene knew he was in trouble half-way through the shot, taking his hand off the bat. Mathews pushes a single into the covers to bring new batsman Dinesh Chandimal on strike. He takes a painful blow on the bottom finger of his right hand pushing forward in defence before getting off the mark with an unconvincing drive that loops into the covers but finds an unguarded spot. Anderson strays on to Chandimal's pads and is flicked down to the fine-leg fence for four before a neat steer through point brings two more. A fine, spearing yorker is successfully if not particularly stylishly kept out. Chandimal squared up a couple of times in the over and knocked of his feet by another full delivery that thuds into the pad. It's comfortably missing leg, but England's desperation for wickets is exposed by the fact they opt to review it. Might just have been umpire's call on a fourth stump. Terrible review. [wicket]Brainless batting from Chandimal. Plunkett back into the attack, and the Sri Lanka wicketkeeper - who has looked all at sea in his brief stay at the crease - hammers a short ball straight to the man stationed at deep square-leg. [wicket]Sri Lanka have fought so hard to get into this position. They are now tossing it away. 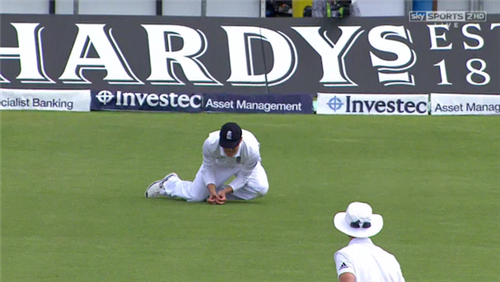 Prasad carves his first ball straight to third-man, where Root takes a really smart low catch diving forward. Can only think the batsman didn't know there was a man down there. Steered it straight to him. The batsmen cross, so it's Mathews to play Plunkett's second hat-trick ball of the match. He shovels it to square-leg for a single. New batsman Herath steers the last ball of the over into the covers where there's an easy single, but Mathews wants the strike. I umpired the other day and it is actually hard to count to six! Especially without any stones! Field set deep for Mathews as England, predictably, stop trying to get him out. Still manages to find a two on the legside and a single off the last ball when the field inexplicably fails to come in to cut it off. In between, he edges a full, wide delivery that Prior fails to gather. Might have just carried, might have been on the half-volley. Would definitely have been referred upstairs and given not out. Plunkett starts the over with a short bouncer that sails harmlessly over the keeper's head and is signalled wide. Mathews turns down singles from the next two balls before swatting a huge six over midwicket. Extraordinary shot: length ball, just dispatched. Takes a single from the next to leave Herath two balls to survive. He survives the first so securely that Steve Davis decides there's no need to go through the motions of ball six and calls over. Everyone's in position for the next over when the message finally comes through, and Plunkett now does have his extra chance against Herath. He bowls an almost sarcastic bouncer. Herath ducks. Mathews having quite a series here. Fair to say he's won the battle of the captains. Clubs Anderson for four down the ground and then adds another boundary to fine-leg. England do have Herath on strike, though. Frustration for England as Herath spoons the first ball of the over just out of Broad's reach at mid-off and calmly jogs his single to get off strike. Mathews pulls the third ball of Plunkett's over out to deep midwicket with the intention of running two but has to settle for a single. Three balls to survive for Herath. He does so via a blow on the thigh, a play and miss, and a duck under a bouncer. Broad is back on for another spell. Mathews is looking for a single late in the over but times his guide to third-man and gets four, meaning Herath will be on strike to Plunkett. Herath survives an over of short-pitched attack from Plunkett, including a no-ball. Mathews walks across his stumps and works a single into the leg-side from Broad's fifth ball. He's milking the strike with ease. Mathews spends the first half of Plunkett's over drilling excellent pull shots to deep square-leg and long-leg for no runs. Field comes up after four balls. Mathews backs away looking to free up the offside, but Plunkett follows him. Last ball of the over is short, and Mathews can't beat the infield. Broad's not fit here. Way down on pace. Herath helps himself to four through midwicket to take the lead past 200 and then works the ball into the legside for two more. Tries to duck under a ball that's not that short and gets a whack on the back, but he's made it safely to the lunch break. [lunch]Great session that. 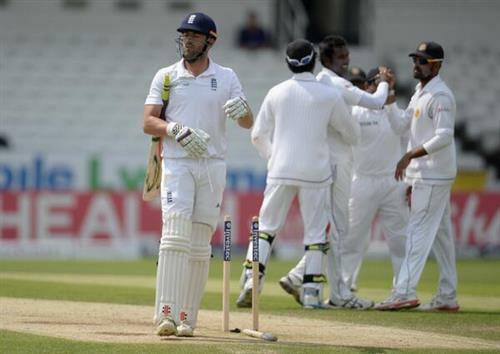 Sri Lanka lost three wickets, but with 97 runs added they will probably settle for that. England will have to chase over 200 in the fourth innings to win this series. No gimme. By any stretch. And with Mathews looking imperious, there is ample scope for Sri Lanka to push that lead up towards and even beyond 250 here. What a shot! Glorious pull shot for four off Broad from Herath to bring up the hundred partnership. Herath follows that with a gorgeous square drive off the front foot. Toying with England now. Front foot, back foot, legside, offside. 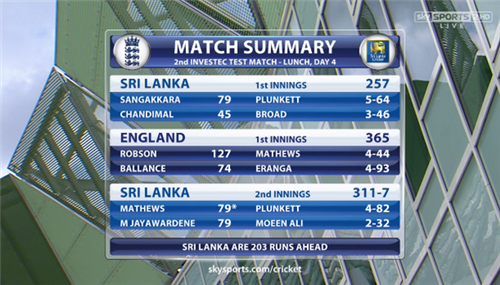 However poor England have been in this innings - and they have been so, so poor - Sri Lanka have been magnificent.